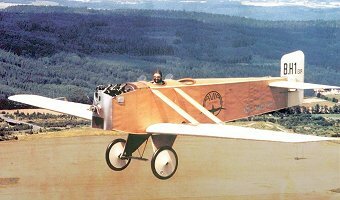 The Avia BH-1, replica of the aircraft originally manufactured in 1920, has been built by Mr. Marcel Sezemský in the ULL category under LAA CR. This aircraft successfully passed its virgin flight in 2000 year. There are compared individual versions of original aircraft and replica in the table below. It is remarkable that the version exp with the Austro-Dailmler engine would nicely fulfill today's weight limits of two-seat ultralight aircraft. Concerning to minimum airspeed, their original values have not been preserved though, nevertheless with respect to identical dimensions of the replica and its template, used materials and comparable weights it is possible to assume that also this parameter would be met.